TriBellaTM is the most complete facial rejuvenation therapy available from one versatile device, exclusively from Venus VersaTM. 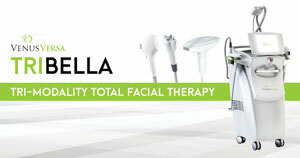 TriBellaTM combines the power of three unique treatments—a photofacial treatment, anti-aging treatment, and skin resurfacing treatment—into one complete high-intensity, non-invasive skin renewal procedure. The TriBellaTM photofacial treatments feature Intense Pulsed Light (IPL) technology that targets and corrects discoloration, age spots, sun damage, and uneven skin tone, while SmartPulseTM technology and a Real-Time Cooling ensure consistent results and patient comfort. The anti-aging treatment utilizes (MP)2 technology—a synergistic fusion of Multi-Polar Radio Frequency (RF) and Pulsed Electro Magnetic Fields (PEMF)—to enhance natural collagen and elastin production to smoothen fine lines, firm up skin, and fade the appearance of wrinkles. The final treatment in the TriBellaTM procedure, the skin resurfacing treatment harnesses the power of NanoFractional RFTM and patented tip technology to improve the appearance of textural skin conditions, such as acne scars and other scars, rosacea, uneven skin texture, enlarged pores, dyschromia, and pigmentation. The best candidate is someone with signs of skin aging and damage, such as lines, wrinkles, uneven complexion, or uneven texture. Venus VersaTM TriBellaTM treatments work to improve the look of skin tone, elasticity, and texture. While the individual treatments are quite comfortable, there will be some mild discomfort after having 3 treatments in a row and the sensation will vary by individual tolerance levels. A light snapping sensation or an increase in warmth may be expected during the photorejuvenation treatment; however, the applicator’s Real-Time Thermal Feedback feature and Real-Time Cooling system are designed to make the treatment as comfortable as possible and may completely disguise the snapping sensation for many people. The anti-aging treatment will feel like a hot stone massage on your skin and is generally described as very comfortable. Because the skin has been heavily stimulated before the skin resurfacing treatment, patients may experience more discomfort during this third and final treatment in the TriBellaTM series. Topical anesthetic may be applied by the treatment provider to minimize discomfort before this third and final treatment. Treatment prices vary by region and can be anywhere from $600 to $1,000 per TriBellaTM treatment, depending on the clinic, local market, and other factors. Each TriBellaTM treatment session takes approximately 1.5 hours to complete using three applicators with 10 minutes of delay between individual treatments. Three TriBellaTM treatments are recommended for optimal results. While some results will be visible after the treatment series is complete, best results occur approximately three months after the last treatment session. How long the results last, however, will depend on how the patient’s skin reacts to the treatment and after-treatment care. For example, if the patient properly protects skin from the sun, the results will last longer. 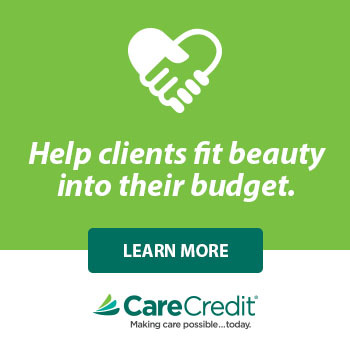 To maintain best results, treatment providers will discuss customized maintenance programs with each patient and a touch-up session every six months is generally recommended. All clinics carrying Venus VersaTM TriBellaTM technology are certified treatment providers with access to continuous clinical education. As with all medical aesthetic treatments, prior to your initial treatment, a consultation and test treatment will be performed. If determined appropriate, each TriBellaTM treatment will be conducted either by a physician, nurse, or other certified treatment professional. 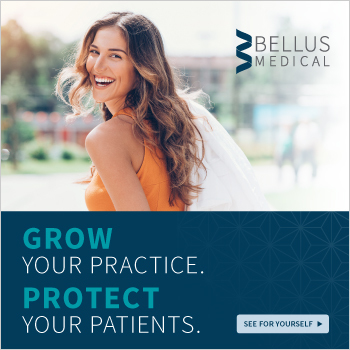 Treatments with TriBellaTM are considered a medical treatment, therefore, as with all medical treatments, prior to your initial treatment, the medical spa should conduct an in-person exam by either a doctor, a nurse practitioner or a physician assistant. While each state treats each procedure differently, AmSpa recommends that only an RN or higher-level practitioner perform treatments with TriBellaTM. Please check with your local medical board, nursing board or health care attorney for more information. To find your nearest certified treatment provider, you may utilize the clinic finder at . Skin will be sensitive to sunlight and red following treatment. No makeup or skin care products, aside from the treatment provider’s recommendations, should be applied to the treatment area for a few days following treatment, at which time sun protection should also be applied regularly. As well, it is important to note that TriBellaTM consists of three treatments—photofacial, anti-aging, and skin resurfacing. Photofacials are powered by IPL technology, which targets pigment in the skin. They tend to work best for light to medium skin tones because the heightened stimulation poses a greater risk of discoloration to patients with more pigment in their skin. While those with darker skin types may be candidates for the treatments separately, all treatments performed together in one session may not be the best fit for them. Treatment providers will perform a test spot and/or make individual recommendations for each candidate with skin type and safety in mind.